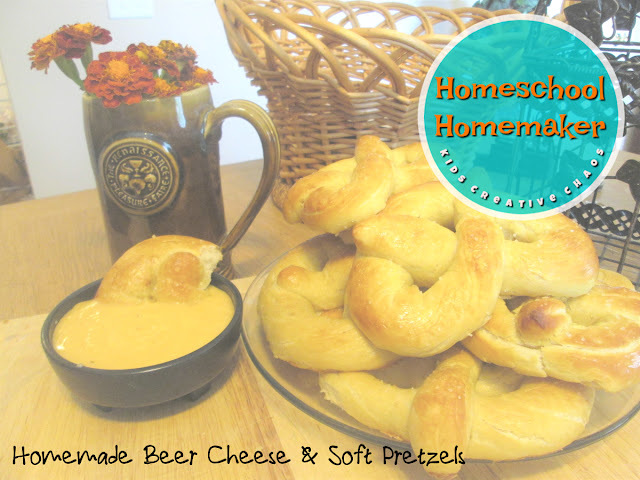 This homemade Easy Beer Cheese Dip for Pretzels Recipe is delicious! You'll feel like you're eating restaurant or bar food at home. 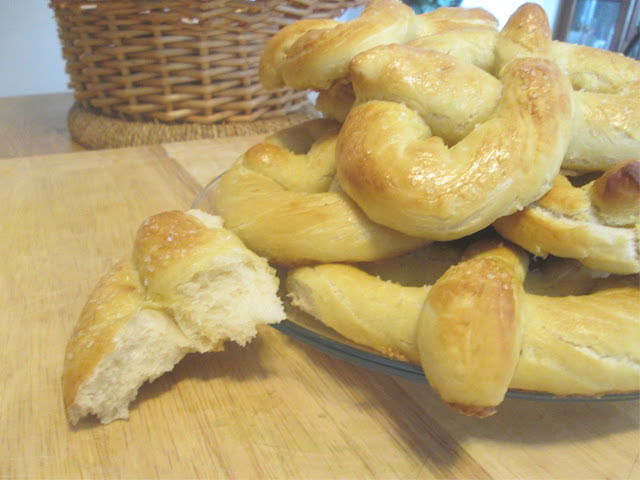 Who can resist the warm baked goodness of homemade soft pretzels? Beer Cheese and pretzels are the perfect fall snack. Enjoy! Melt butter in a saucepan over medium heat. Add flour. Whisk, while heating, until mixture is golden brown, 1-2 min. While continuing to whisk, gradually add the beer. Cook, with stirring, until mixture partially thickens. Add milk; continue to whisk until mixture reaches desired consistency. Remove from heat. Stir in mustard, garlic powder, pepper and cheese. Stir until cheese has melted. Adjust seasonings as desired. Dissolve yeast, salt, and sugar in warm water. Allow the mixture to sit until the yeast begins to foam or bubble. Add the melted butter, followed by the flour, 1 c at a time. The dough should be workable and not sticky. 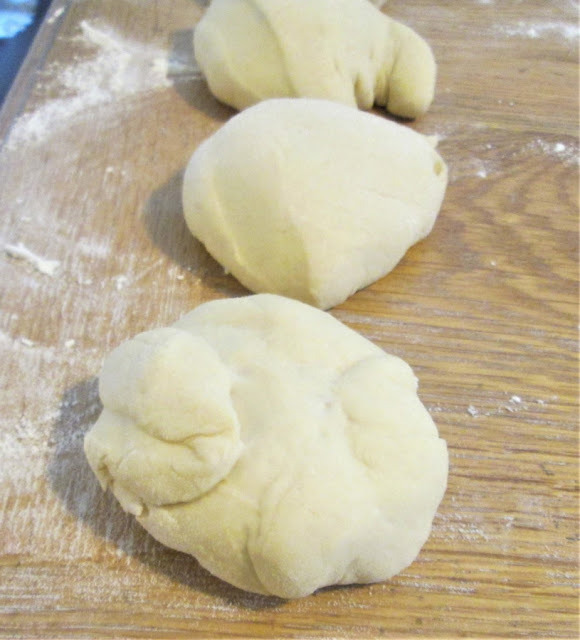 Knead the dough on a floured surface for several minutes. Place the dough in a greased bowl, cover with plastic wrap, and allow to rise in a warm place for about an hour or until doubled in size. 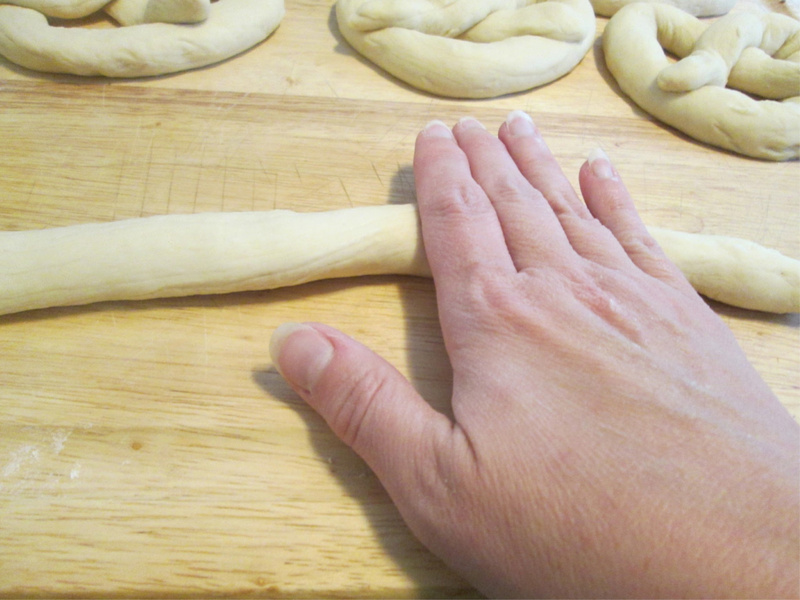 How to roll pretzel dough. 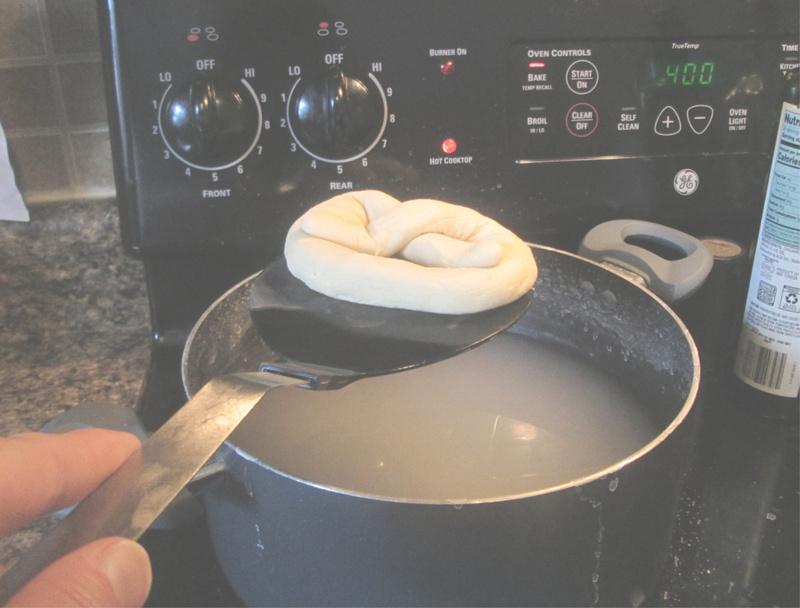 While the dough is rising, boil water and add the baking soda. Stir until dissolved. 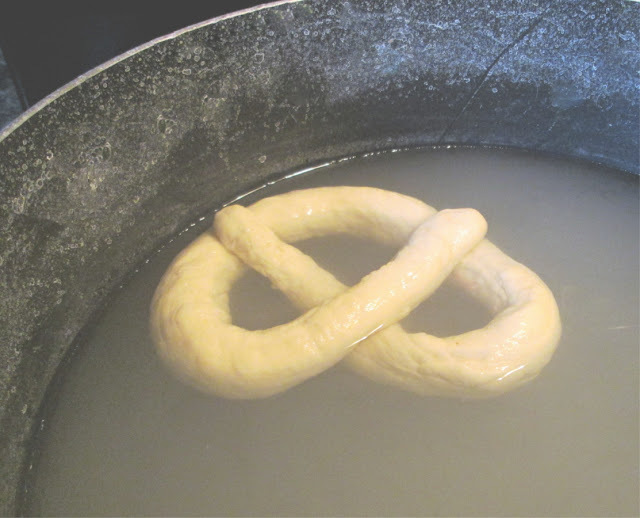 The baking soda bath with be used to give the pretzel a puffy dough with a golden and shiny crust. You should also assemble a few handy tools: a tape measure, a large flat spatula, your baking sheet, and parchment paper. 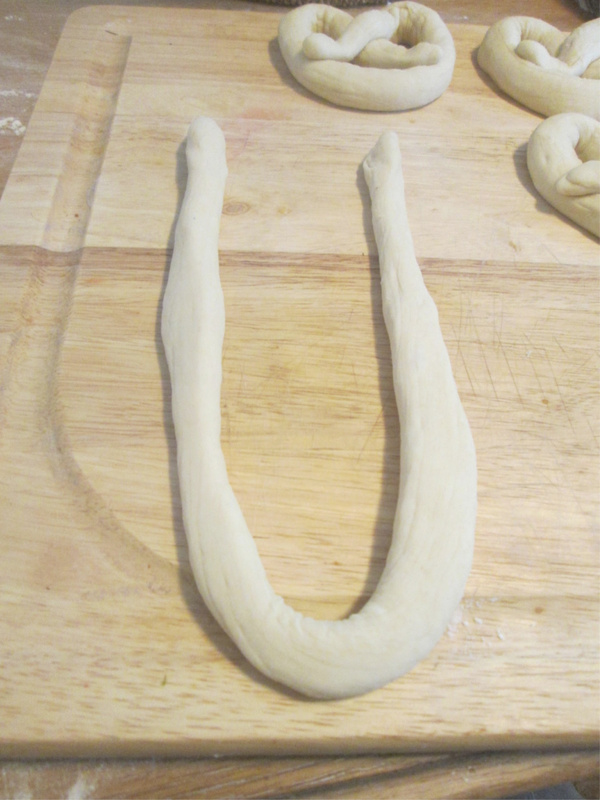 The parchment paper is not essential, but it will make the pretzel much easier to remove from the baking sheet. 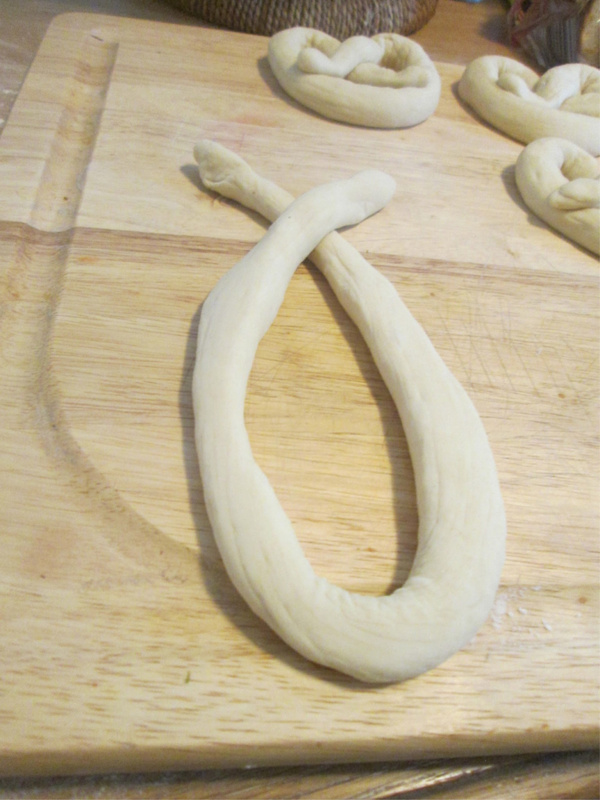 Divide the risen dough into 10 equal pieces. Roll each into a 20 inch rope. To form the pretzel shape, bend the rope into a "smile" shape. Cross the ends slightly. 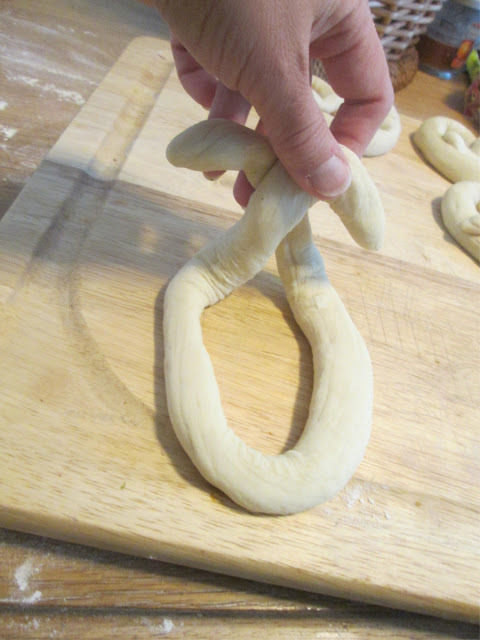 Grab the cross and fold it towards you, bringing it down to meet the front loop of the pretzel. How to Make Pretzel Shape Pretzels at Home. 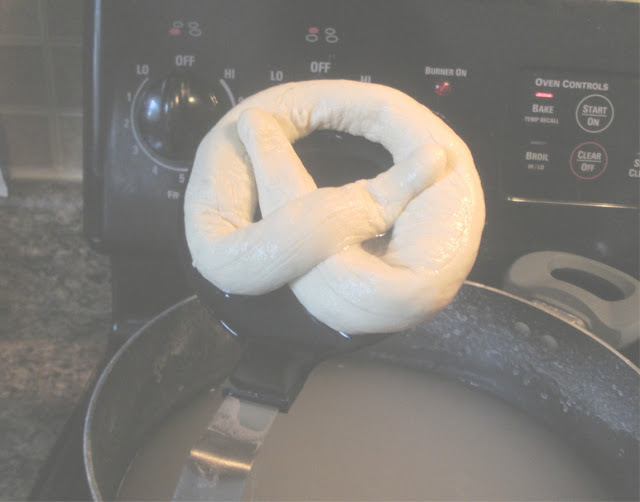 Preheat the oven to 400 degrees F. Using your large spatula, place each pretzel individually in the baking soda bath. Allow it to sit in the bath 30 seconds to 1 minute, making sure the top gets wet as well. 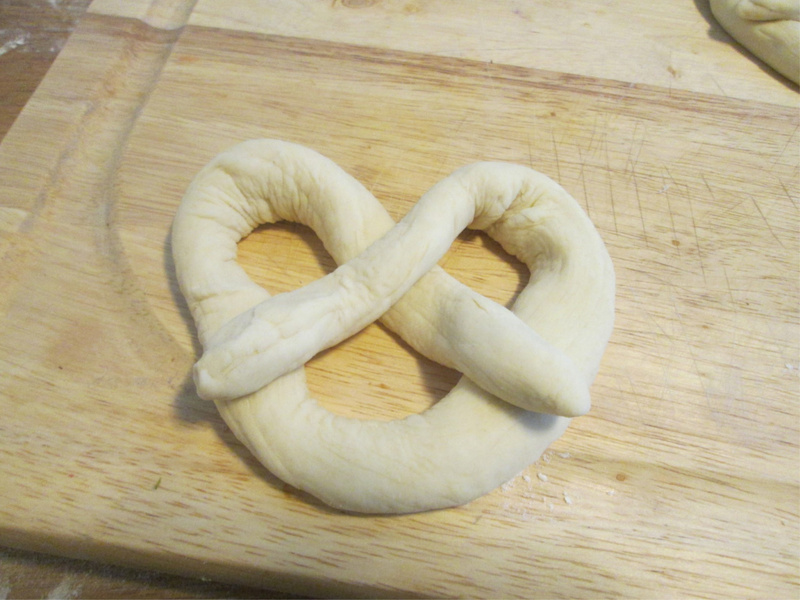 Carefully remove the pretzel with your spatula and place on the baking sheet. Once the sheet is full, bake for 10-12 minutes. 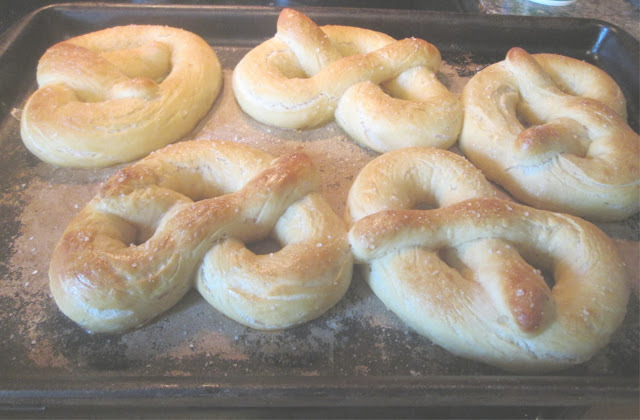 Repeat as needed until all pretzels are baked. Hand twisted, homemade baked pretzels. Don't have time to make them? Just buy Bavarian Soft Pretzels and Beer Cheese Dip on Amazon.